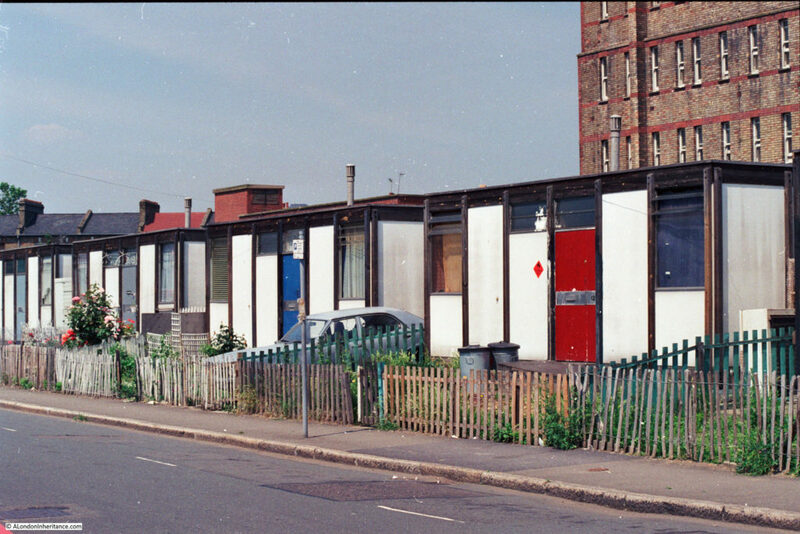 It is really good to have another of my father’s photos correctly identified, I will never know why he labelled it as Flockton Street, I will check the photos again to see if there is one of Flockton Street as perhaps the wrong photo was labelled. 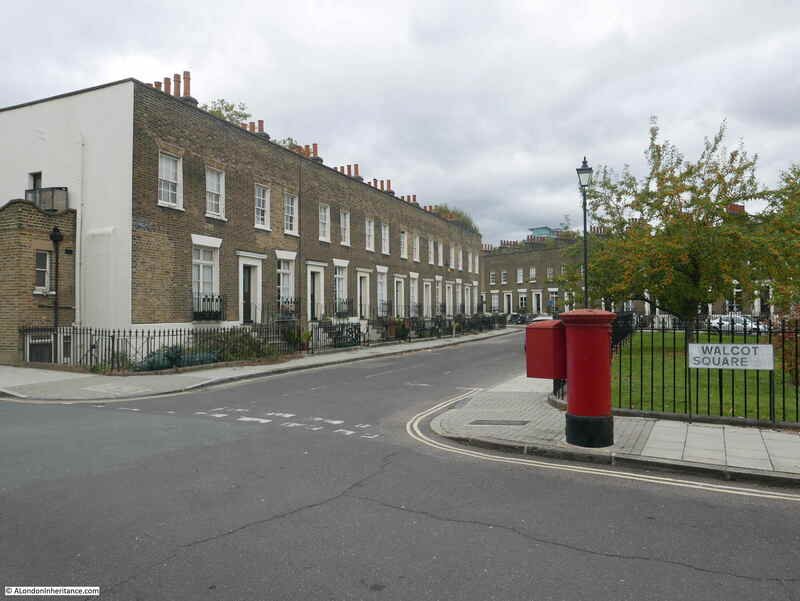 I will also take a walk to Bevington Street to take a photo in the right location. There is no such mystery with today’s location. I worked around Waterloo for 10 years between 1979 and 1989, and one of the lunchtime walking routes was along Lower Marsh, a street lined with shops and a busy market occupying the length of the street. The two photos provide a summary of the changes in the area, as can also be seen across so much of London. 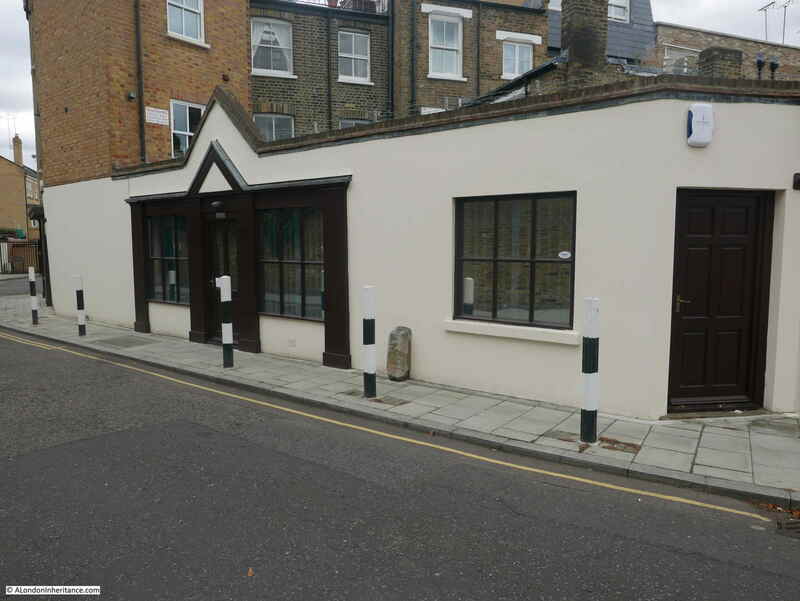 The building is no longer the “House for Value” and is now an independent local supermarket selling artisan bread. 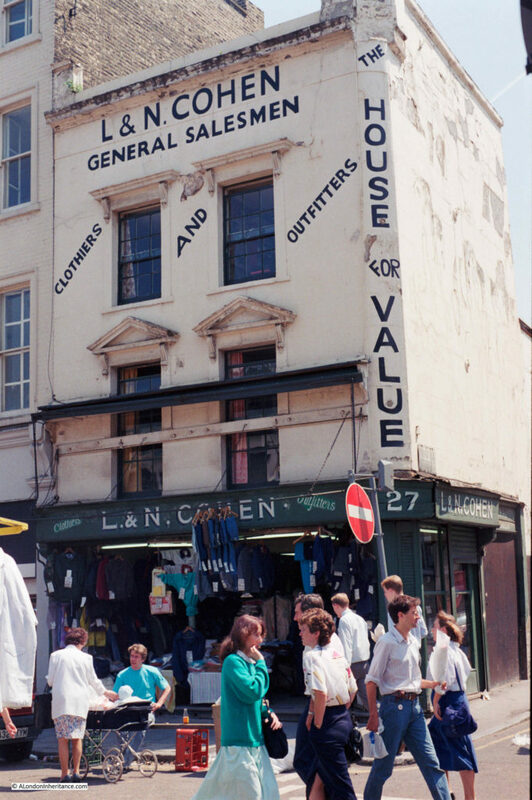 I assume the same Cohen family had been running a clothes shop in Lower Marsh for many years. 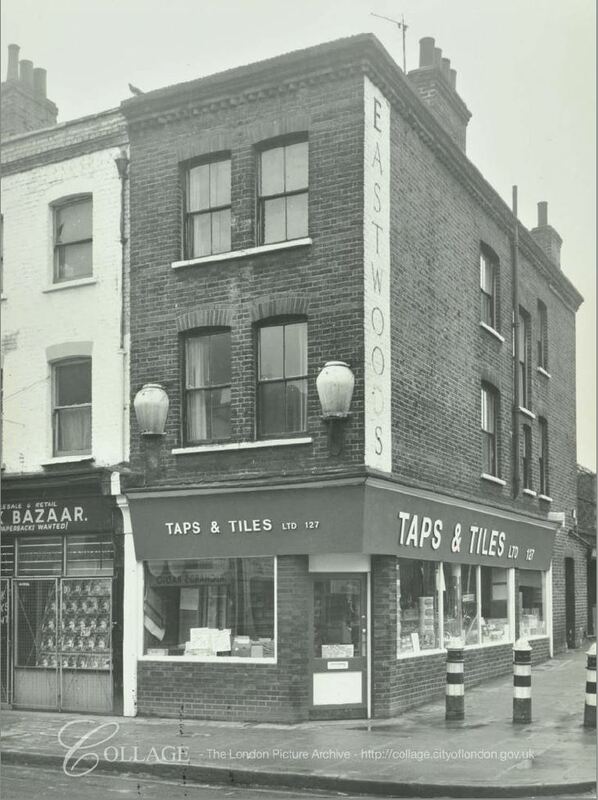 I found the following photo of the same shop in the LMA Collage archive. The photo is dated 1950. 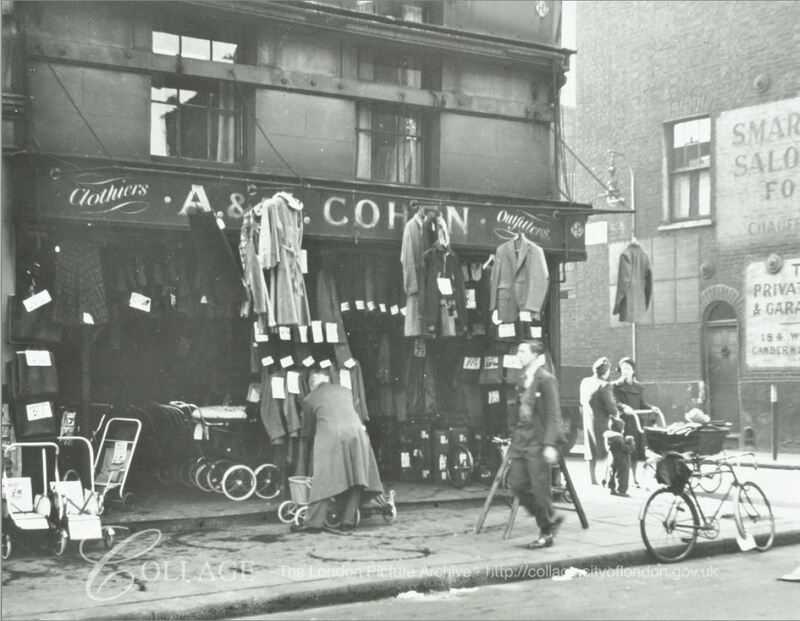 The initials changed between the 1950 and 1986 photos, so I assume ownership of the shop moved to later generations of the Cohen family. It is interesting that the same structures can be seen across the front of the first floor of the building, running across the windows. I could not work out what these were for, whether a very large awning, fixing for signage that was once in place, or strengthening of the building wall. What ever it was, it has long gone and the building today has been considerably renovated and extended along Frazier Street. Lower Marsh runs in the shadow of Waterloo Station. 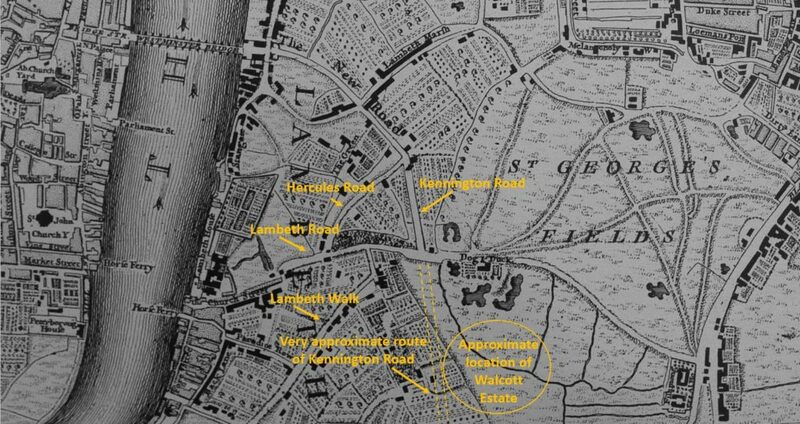 The name hints at what the land in the area was like before the developments between the street and the river. 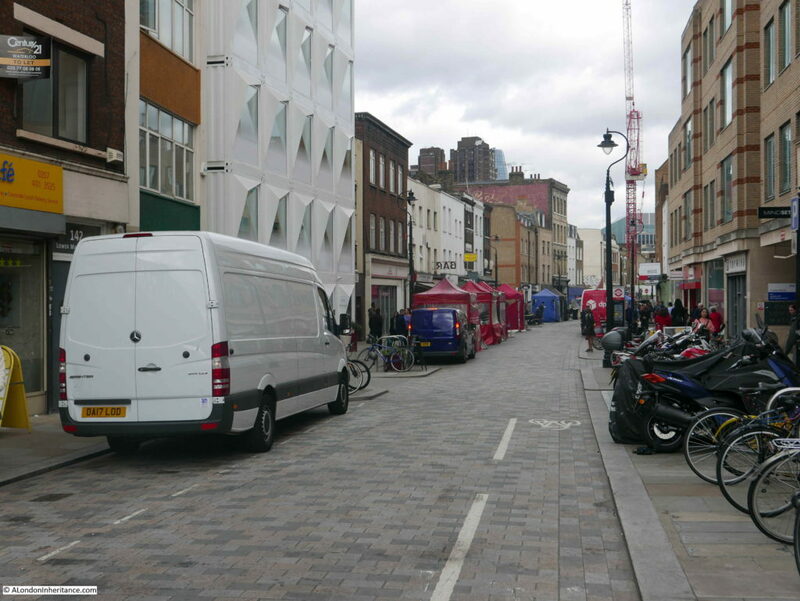 When I worked in the area the street was always known as the Cut rather than Lower Marsh. 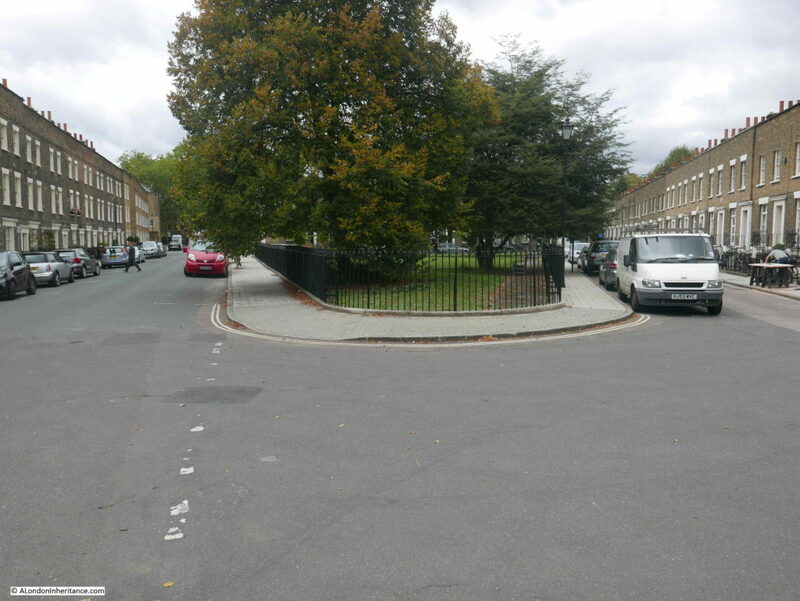 However the street today named The Cut runs to the east of Waterloo Road. 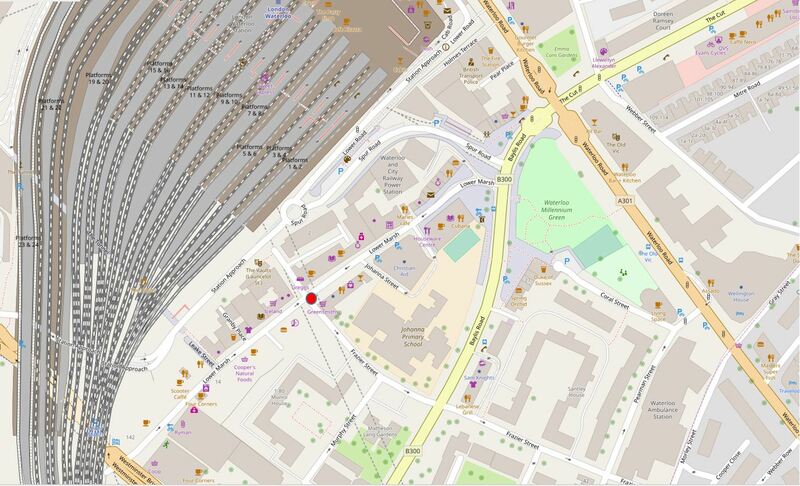 The following map extract shows the location of the building (the red dot, just to the lower left of centre), Lower Marsh runs from lower left to upper right. Waterloo Station dominates the area to the north. 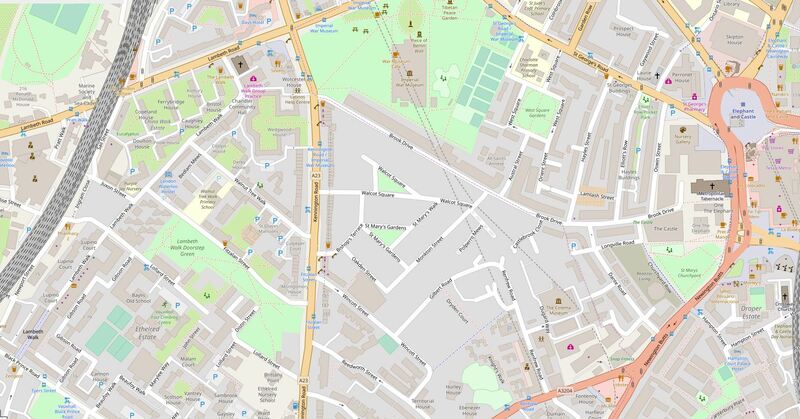 Waterloo Road is the orange road on the right, with The Cut leading off Waterloo Road to the top right corner. 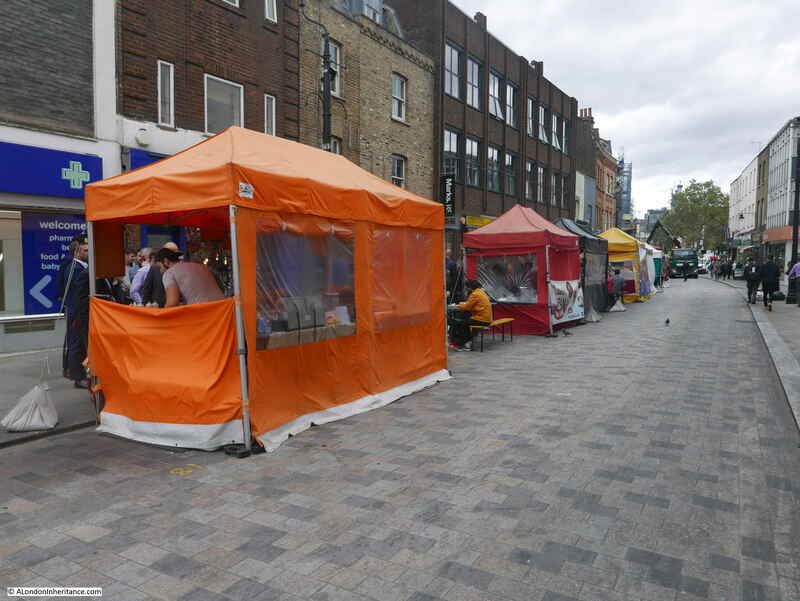 When I work in the area, the Lower Marsh market was always busy with the street lined with stalls selling all manner of typical market goods, however today, the street appears much quieter with nearly all the stalls selling food. 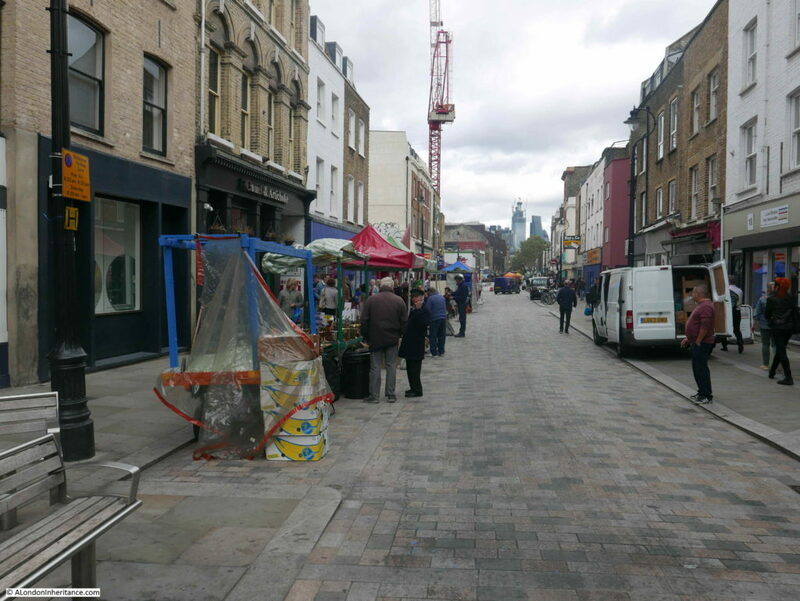 I have not walked along here for a few years, so not sure if this was a typical day, however it is a very different market to that of the 1980s. 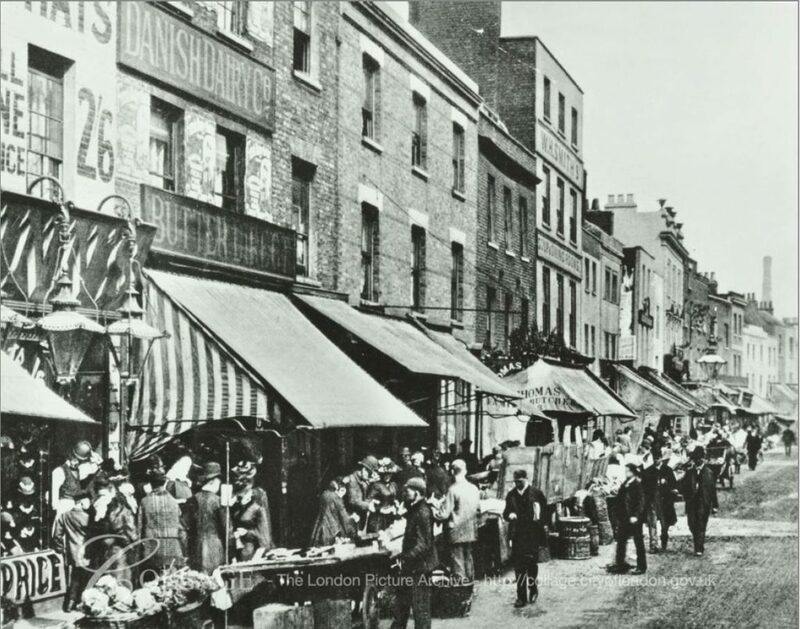 “SUNDAY TRADING IN THE NEW-CUT: The Lower Marsh, Lambeth, which is popularly called ‘the New-cut’, has long been the regular weekly haunt of a numerous assembly of costermongers, dealers in fish, rabbits, and pork, sellers of cheap hosiery, pottery, hardware, trinkets and toys, who have been permitted to set up their little stalls, or to place their barrows and baskets at the sides of the wide street. This trade has gone on every Sunday at eight o’clock in the morning to one in the afternoon, while most of the neighbouring shopkeepers were obliged in self-defence, to have their business open at the same time. 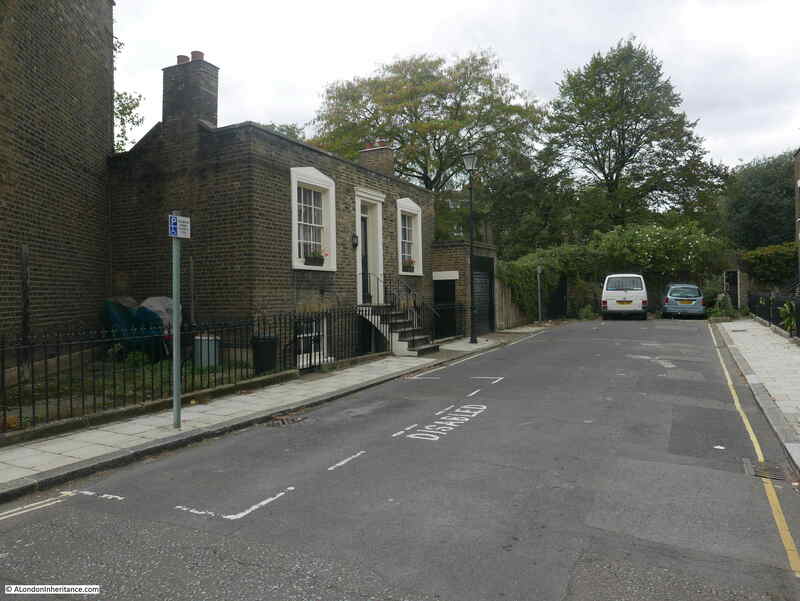 Two or three weeks ago, the vestry board of St. Mary’s, Lambeth, passed a resolution to the effect that printed notices should be posted through the parish, cautioning all persons in the habit of exposing goods for sale that such a practice would not in future be allowed on Sunday mornings, and that any person so found offending would be summoned before the magistrate on the charge of creating an obstruction, the penalty on conviction being 40s. It was also resolved that the inspectors of nuisances for the parish should be employed to see that the terms of the notice were strictly enforced. The police authorities had declined to interfere, unless the order were to be applied to shopkeepers as well as to costermongers; but a double force of constables was placed on duty to prevent any breach of the peace. On Sunday week, the trade began at the usual hour, but at nine o’clock, six of the Lambeth nuisance inspectors, in uniform, appeared upon the scene, and, accompanied by police-constables and followed by a large body of roughs, yelling and hooting, visited the stall-keepers in succession, ordering each to remove the stall, barrow or basket at once. If they merely removed to other places, they were followed by an inspector, who took down the name and address of the offending dealer, informing him he would be summoned. 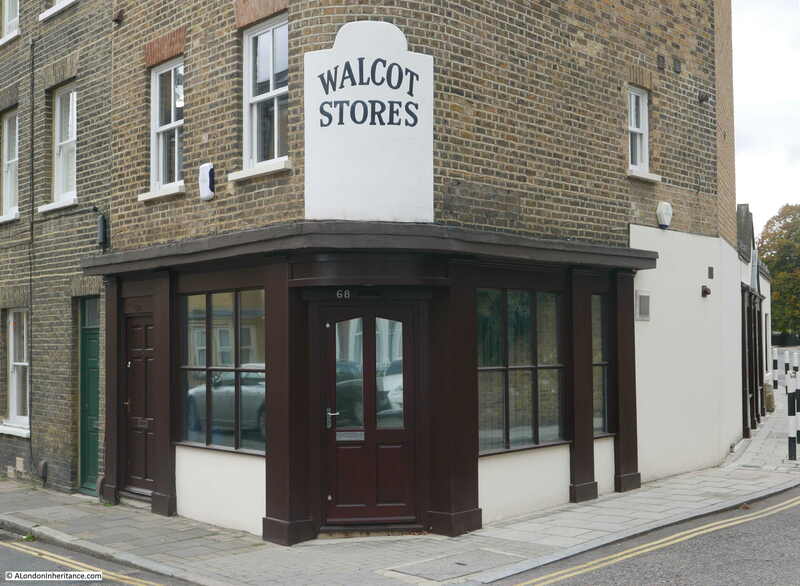 The articles goes on to state that the issue was discussed further in a number of vestry meetings, with a considerable number of shop-keepers, rate payers, shop assistants and costermongers urging the vestry that regulation rather than prohibition was required. 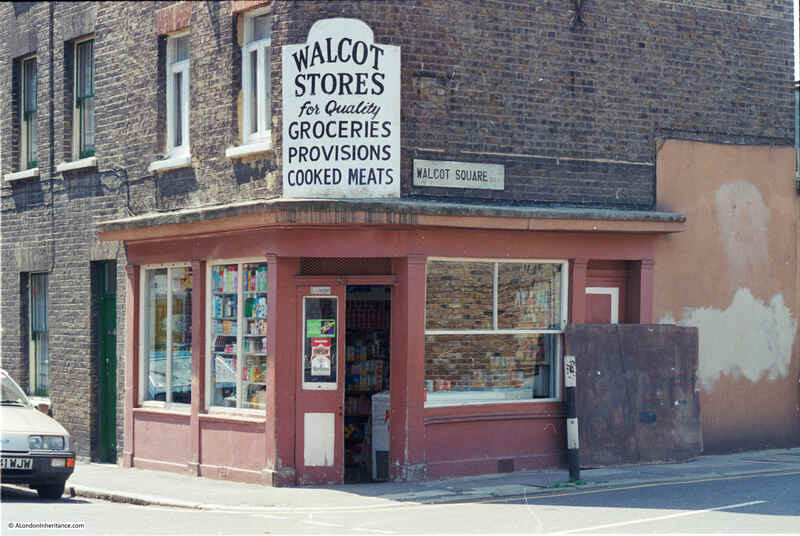 The vestry agreed on a compromise that allowed the market to go ahead on a Sunday morning, providing the stalls were removed by half-past ten o’clock, before church time. 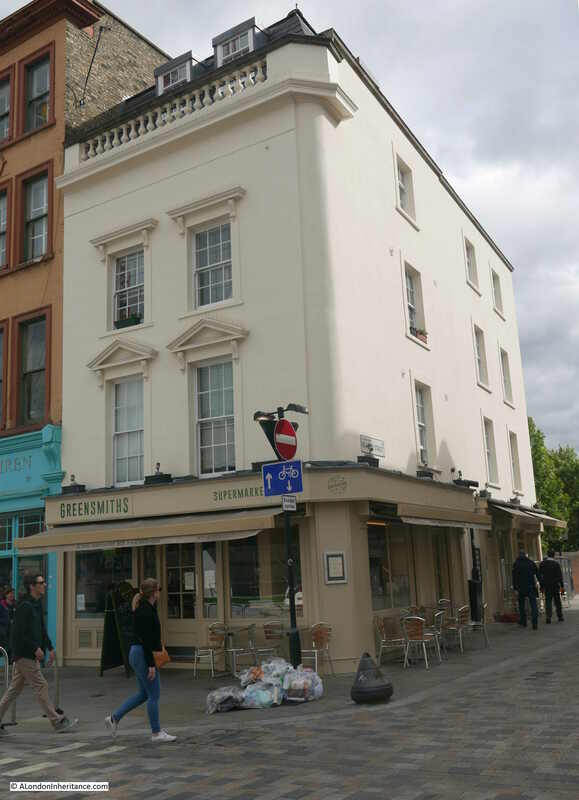 There are still many interesting 19th century buildings along Lower Marsh. 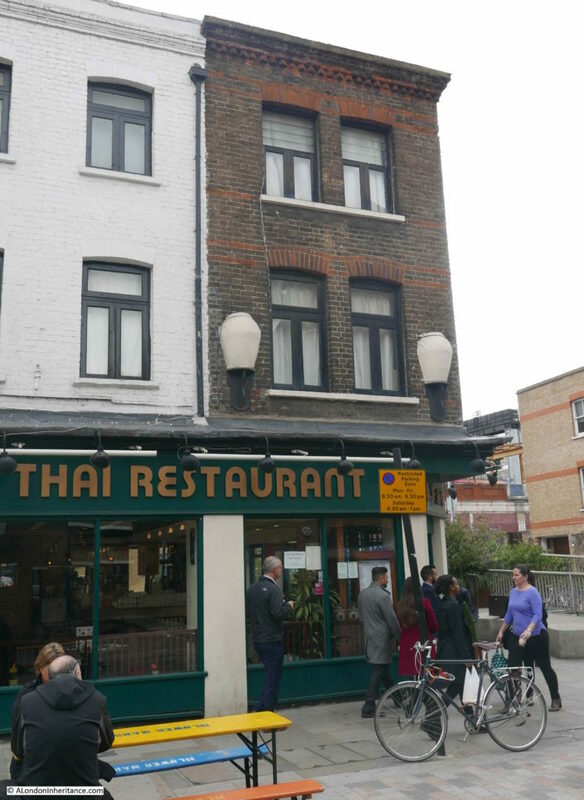 On the front of one building at 127 Lower Marsh, there are two large urns on the either side of the first floor windows. The Eastwood’s sign on the side of the building in 1972 has disappeared. I have not been able to find out if this was the name of a possible oil shop, or some other business on the premises. The London metropolitan Archives, Collage collection has a number of photos of the Lower Marsh market over the years, the following are a sample. The first is one of the earliest I could find and is dated 1896, only 24 years after the Sunday trading issues detailed earlier in the post. This is from a time when the majority of shops had awnings and frequently large advertising boards across the facade, as can be seen with the Danish Dairy Company in the above photo. 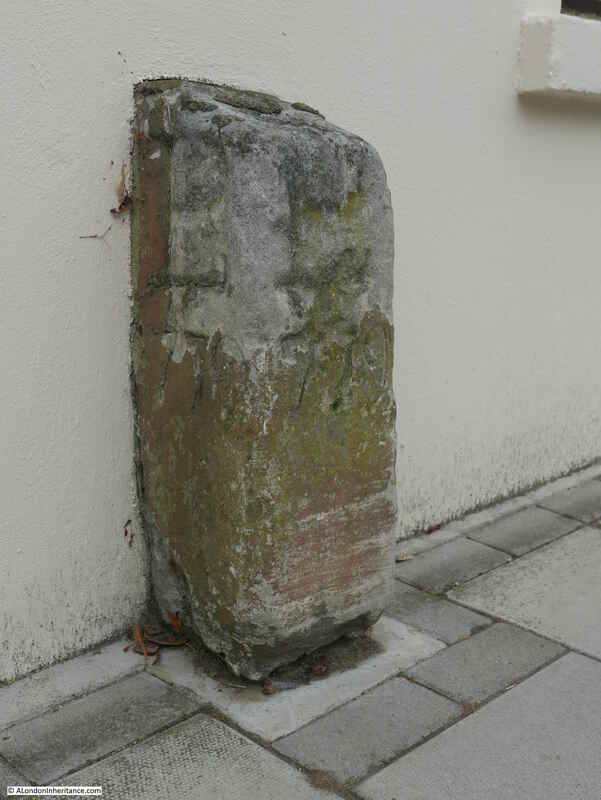 I wonder if the remains of these fixtures could still be seen across the front of Cohen’s shop in 1986. The following photo is from 1950. The text that goes with this photo states that “the market stretched from Blackfriars to Vauxhall”. 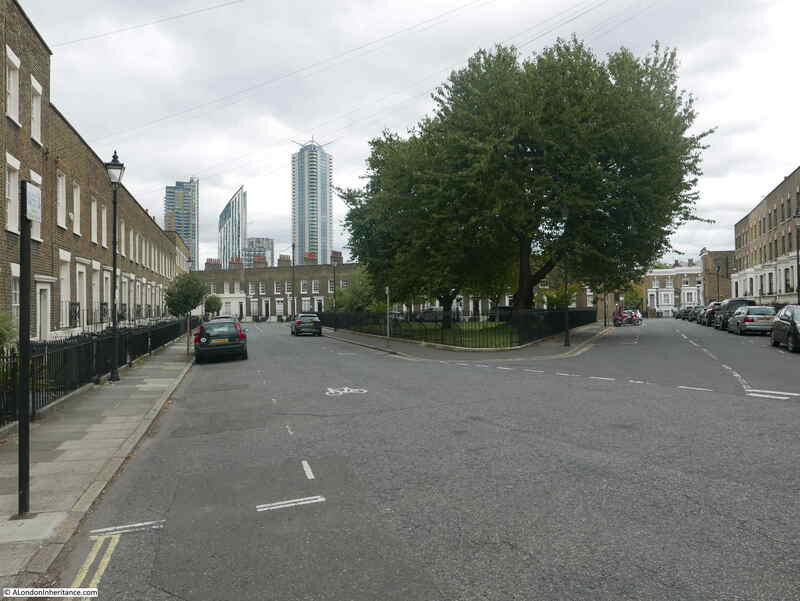 I have not been able to find any evidence that the market stretched all the way from Blackfriars to Vauxhall – this would have been a considerable distance. 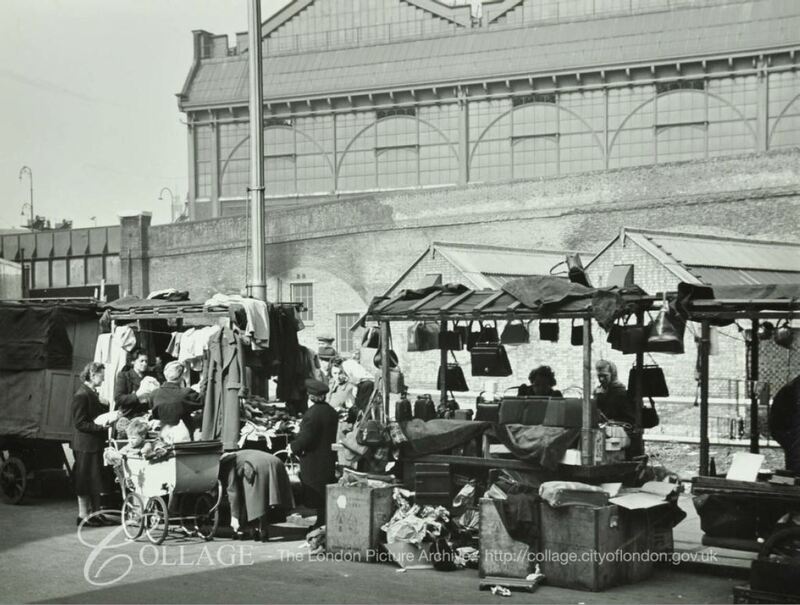 It may have been that, as described in the 1872 Illustrated London News article, costermongers and traders could have sold from baskets and stalls anywhere along the roads south of the river from Blackfriars to Vauxhall, rather than a single, organised market. 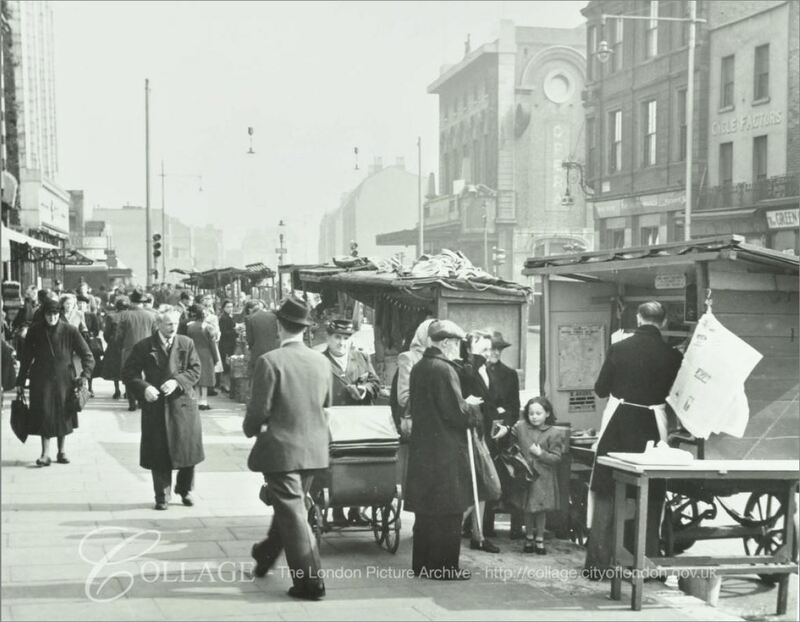 Street trading was much more haphazard before the 20th century. 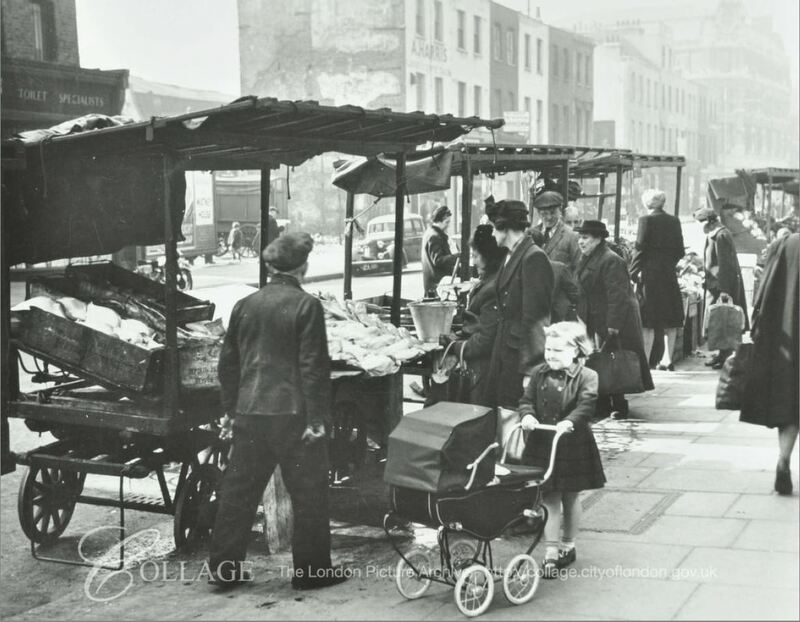 This photo is again from 1950, and is at the eastern end of Lambeth Marsh, close to the junction with Waterloo Bridge Road. This final photo from the Collage archive is also towards the Waterloo Bridge Road end of Lambeth Marsh. The photo is from 1950 and shows Waterloo Station in the background. I hope the early Friday afternoon that I walked down Lambeth Marsh was not a normal market day, it was very quiet and with considerably less variety than the market of the 1980s, however demographics change and I suspect the market today reflects local demand as it is, rather than as it was. 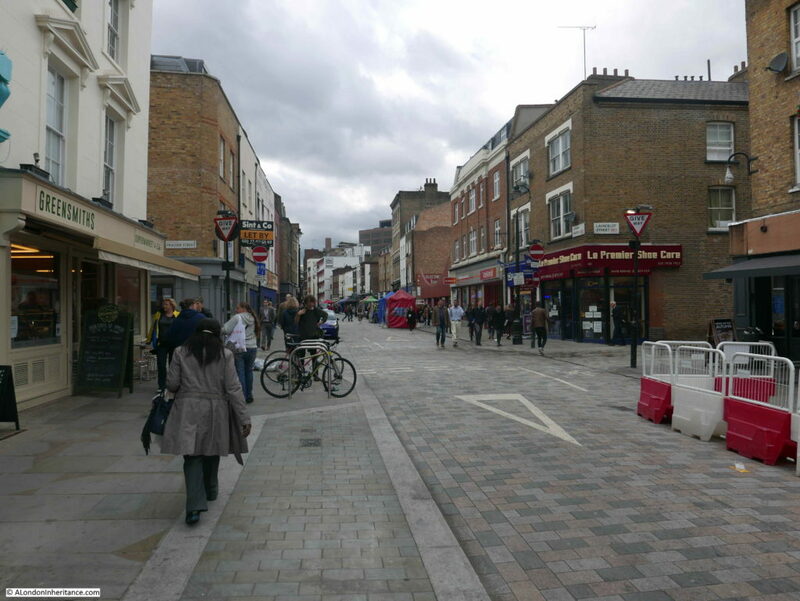 These changes between 1986 and 2018 can be clearly seen in the changes to 27 Lower Marsh. 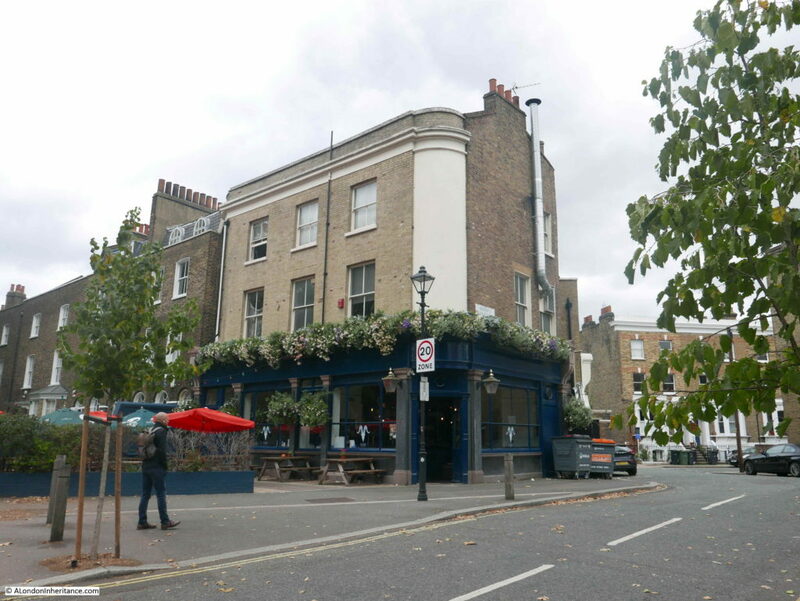 This entry was posted in London Buildings, London Streets and tagged Lambeth, Lower Marsh, Waterloo on October 21, 2018 by admin.